On May 15, Fox will air a special episode of The Simpsons in which Homer will select questions that fans tweet to him and then respond at the end of the show. That's right, kids—Homer live. And how will a drawn character pull off such a feat? "We're going to play it close to the vest on this one," is all Fox's vp of global brand management Peter Leeb would tell us. "A live show is very relevant in today's market," he added. "We try to stay current." No kidding. If The Simpsons has excelled at anything, it's staying current. Not that it hasn't excelled at plenty of other things. Not only is The Simpsons the longest-running TV show in history—it airs every minute of every day in any of 180 countries—it is also a multimedia colossus. Since 2014, the entire series has been streamed on Hulu. There is Simpsons World, a mobile video app packed with a quarter century's worth of episodes, plus extras like Simpsons news. 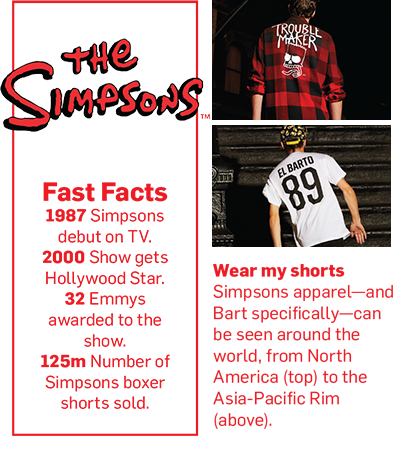 Some 10,000 Simpsons products (from boxer shorts to shot glasses to cosmetics) sell in 100,000 retail stores across the globe. There is a life-size Simpsons house in Nevada and a ride at Universal Studios. There is a Bart Simpson balloon in the Macy's Thanksgiving Day Parade, a Simpsons star on the Hollywood Walk of Fame and an entry for Homer's signature expostulation "d'oh!" in the Oxford English Dictionary. The Simpsons, as director Morgan Spurlock wrote in his 2010 Simpsons 20th Anniversary Special, is a "comedic freight train and marketing juggernaut that's gone off the rails and has completely altered the cultural landscape as we know it." Now: If you owned this franchise (reported value: $13 billion), would you keep it current? You bet you would. Given the cultural ubiquity of the Simpsons, it's chilling to think how close the show came to never being made at all. Underground cartoonist Matt Groening had been drawing in obscurity for 10 years when a friend of his gave producer James L. Brooks one of his "Life in Hell" strips as a gift. In 1987, when The Tracey Ullman Show was looking for some animated characters to put in the 30-second bumpers before the commercials, Brooks called Groening—who sketched Homer, Marge, Maggie and Bart off the top of his head. Good as the characters were, Brooks still had to strong-arm Barry Diller, CEO of the cash-strapped Fox, to make the Simpsons into a series. That was 27 seasons ago, and counting. It begs the question: Is there such a thing as too much Simpsons? Most fans will say no—though there are some who grouse that the show's best days blew past in the mid-1990s. "For the love of god, they've told every conceivable story these people could have gone through. It's all been beaten to death," said TV expert Ray Richmond, co-author with Groening of The Simpsons: A Complete Guide to Our Favorite Family. And yet, he added, "The Simpsons is still better than 90 percent of the shows on TV—27 years on."